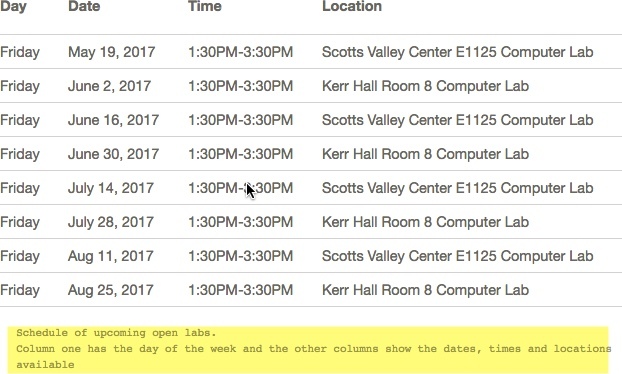 This page describes how to use tables in the Campus WCMS. Tables should not be used for design/layout purposes. This is because, without care and correct labeling, they are not accessible for people who use assistive technology such as screen readers. They also create other design problems. 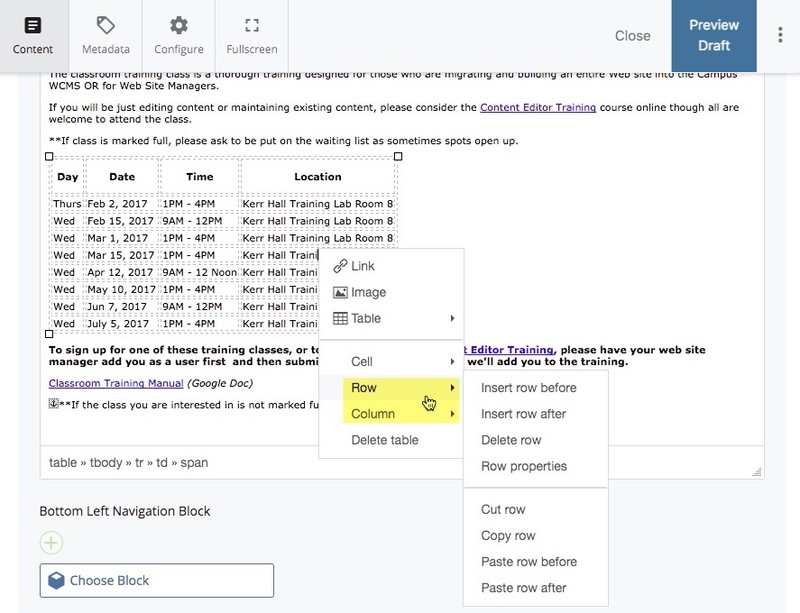 Our built-in styles make it difficult to use tables for design/layout purposes, so it will be frustrating for those who try to use them in this way. Tables are more useful for tabular data (rows and columns of information), but even then, it is best to keep them simple. In some cases, the List Page is a more graceful way to organize data than a table. For any table inserted on your page, you must enter "alt text" for accessibility purposes. You should also set the Header Row Scope. 1.) On the page where you want to insert a table, click "Edit" and put your cursor where you'd like your table to be. 3.) Select the number of columns and rows. On the "Advanced" tab, enter a description of your table in the "Summary" field. This is important for accessibility purposes and is required by the system. 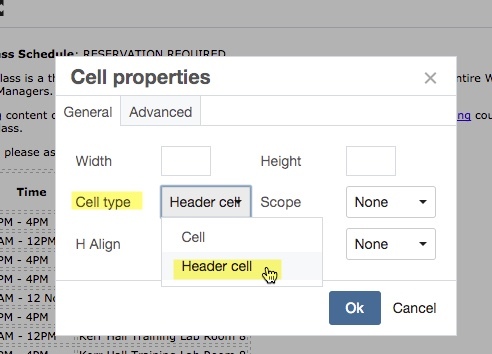 Cellpadding and Cellspacing are set by the style sheets so there is no need to enter anything in those fields. 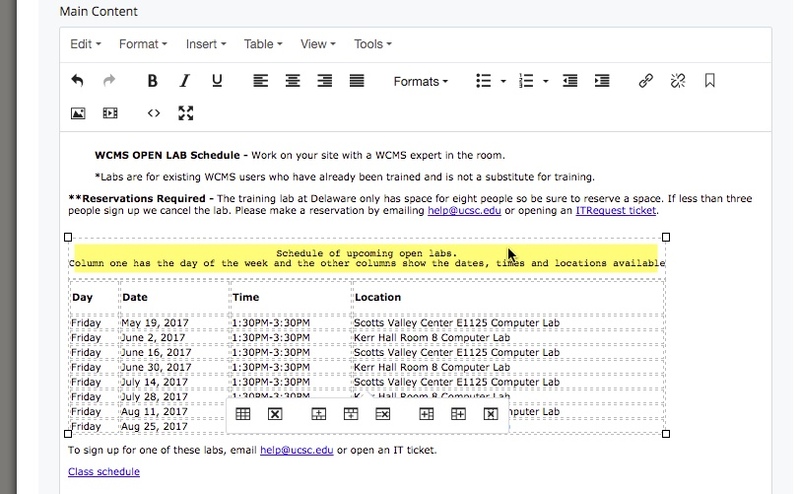 In the WYSIWYG editor, fill in your table with data. Note that you can bold text using the standard WYSIWYG tools. You can also change the size of the table by clicking on it and dragging the sides. Many functions can be accomplished easily by right-clicking (control-click on a Mac). Click "Preview Draft" and then "Submit". Setting the scope of your table columns is an important accessibility component. By setting the scope value in your table's header row, you inform screen reader software what that column is used for. 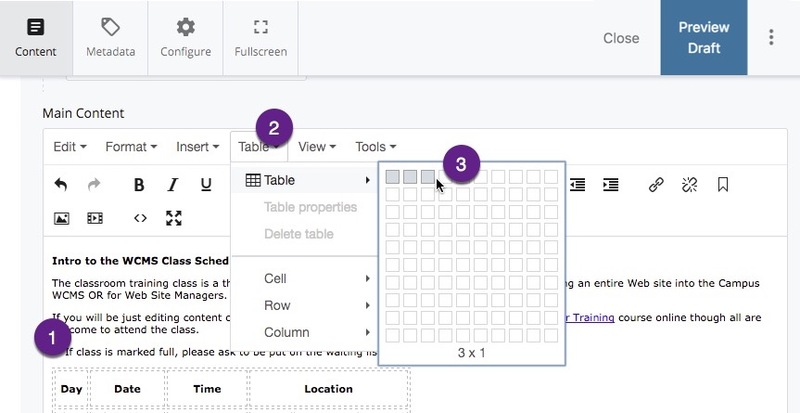 This means that people using screen readers can use your table much more easily because they will now know what kind of data to expect in each column. 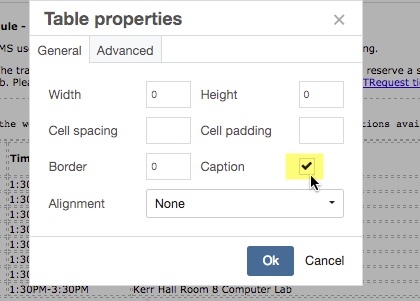 On the right-click menu, select "Cell" and then "Cell properties"
Change the "Cell Type" setting from "None" to "Header cell"